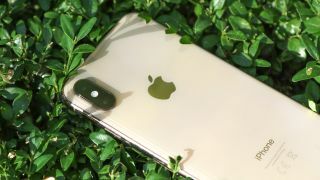 We’re not expecting the iPhone 11 to launch until September 2019, but the first renders supposedly showing the phone have just appeared online, and they're fairly detailed ones at that. Shared with DigitIndia by reputable leaker @OnLeaks, the renders purportedly show the back of one of Apple’s next flagships, with the most obvious feature being a triple-lens camera on the back. This is set into a large, square camera block in the top-left corner that’s raised above the rest of the rear. There’s not much else of interest in the renders. It looks as though the back is made of glass, as we’d expect, and there’s the usual Apple logo and ‘iPhone’ text on there. You can also see what looks to be the same arrangement of buttons as the iPhone XS, with volume on the left edge and power on the right. As well as sharing these renders, @OnLeaks stated that there would be three new iPhone models launched in 2019 – successors to the iPhone XS, iPhone XS Max and iPhone XR. They didn’t say which one we’re looking at here, but given the extra camera lens it’s likely the iPhone 11 Max, or whatever it ends up being called. We would, however, take this leak with a huge helping of salt, as it’s very early for iPhone 11 leaks, especially such detailed renders. Plus, the source says the phones are still in the Engineering Validation Test (EVT) phase, which means there could well be changes before launch, even if these images are an accurate picture of the planned design. Not to mention that the design shown here is, in our opinion, quite ugly, thanks to that huge camera array – and Apple doesn’t tend to go in for ugly designs, so that too makes us skeptical. That said, @UniverseIce (another leaker with a good track record) has claimed the images are accurate, so we certainly wouldn’t dismiss them out of hand.